Ellie Sattler was a graduate student from Montana, specializing in paleobotany (the study of prehistoric plants) and working under the supervision of Dr. Alan Grant. In the original novel, Ellie is described as twenty-four and darkly tanned. She was engaged to Dr. Reiman, a physicist from Berkeley. She has a lesser role in the novel than she does in the movie. 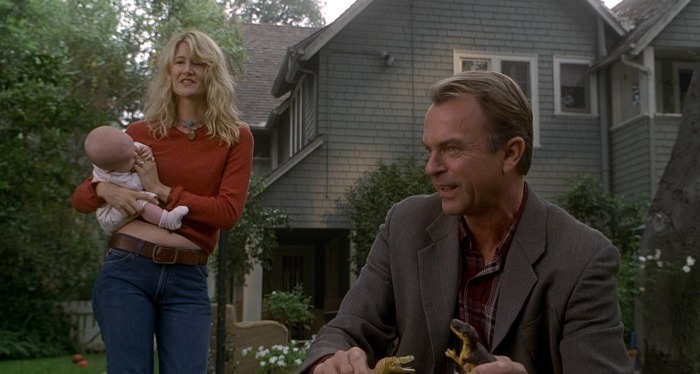 Ellie didn’t appear in The Lost World novel but it was mentioned that she is now married to a physicist from Berkeley and they had two children. She continued to do lectures on prehistoric pollens. 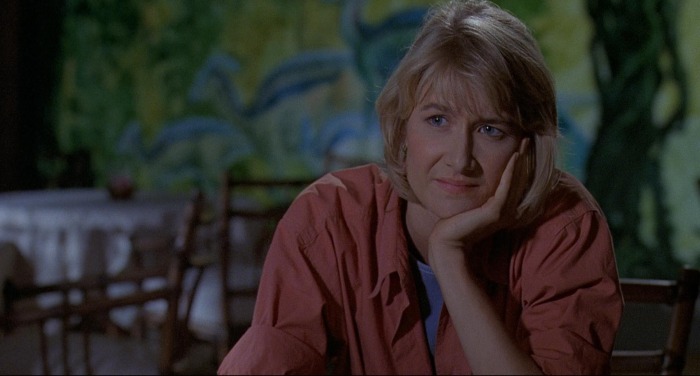 In Jurassic Park, Ellie is played by actress Laura Dern and the character has a bigger role in the movie than in the original novel. Director Steven Spielberg wrote out the character of Ed Regis and killed Gennaro off early so she took over many of their tasks. Spielberg also made it clear that Grant and Ellie were in a relationship as it wasn’t really touched upon in the novel and it added more tension to the film. Ellie accompanies Alan Grant to John Hammond’s Jurassic Park theme park, and like Grant, is memorized by the sight of the dinosaurs. When the group takes a tour in the Ford Explorers, they arrive at the Triceratops Enclosure and discovers the Triceratops is sick. She came to the conclusion that it was because they ate the poisonous West Indian Lilac plants in their enclosure. She starts to have doubts about Jurassic Park after they paid no attention to the poisonous plants and placed them in public places where the dinosaurs could eat them. The group continue the tour in the Ford Explorers while she stays behind to look after a sick Triceratops. After the Tyrannosaurus rex attack, Ellie and Muldoon looks for survivors and finds an injured Ian Malcolm. They put Malcolm in the back of the jeep and continue the search for survivors. They return to the jeep when the Tyrannosaurus rex emerges from the trees and chases the jeep until it gives up. Later, Ray Arnold shuts down the power and Ellie and Muldoon venture out and try to turn the park’s power systems back online manually. They realise that the velociraptors have escaped their paddock and are hunting them. Muldoon covers Ellie while she runs to the Power Shed. She switches the power back on but then a velociraptor attacks her. She escapes and meets up with Grant at the Visitor Center. The raptors chase them and the escape through the air ducts and in the main lobby. As the raptors are about to attack them, the Tyrannosaurus rex bursts in killing one of them. They use this as a moment to escape and they reach the helicopter and leave the island. Ellie has a minor appearance in Jurassic Park 3. It’s revealed that her relationship with Alan Grant had ended since the events in the first film but they remain close friends and she still deeply cares about him. She is now a children’s writer, living in Washington D.C. with her children and is now married to Mark Degler who is an attorney for the U.S. State Department. At the start of the film, she has Alan over for dinner and at the end of the movie, Grant calls Ellie for help when they are stranded on Isla Sorna. She tells her husband and he sends the U.S. Marines to rescue Alan and the group. Why did it end with Alan and Ellie? jurassic park 4. make it with her main character. not jurassic world 2 because shes not in jurassic world!!!!!!!!!!!!!!!!!!!!!!!!!!!!!!!!!!!!!!!!!!!!!!!!!!!!!!!!!!!!!!!!!!!!!!!!!!!!!!!!!!!!!!!!!!!!!!!!!!!!!!!!!!!!!!!!!!!!!!!!!!!!!!!!!!!!!!!!!!!!!!!!!!!!!!!!!!!!!!!!!!!!!!!!!!!!!!!!!!!!!!!!!!!!!!!!!!!!!!!!!!!!!!!!!!!!!!!!!!!!!!!!!!!!!!!!!!!!!!!!!!!!!!!!!!!!!!!!!!!!!!!!!!!!!!!!!!!!!!!!!!!!!!!!!!!!!!!!!!!!!!!!!!!!!!!!!!!!!!!!!!!!!!!!!!!!!!!!!!!!!!!!!!!!!!!!!!!!!!!!!!!!!!!!!!!!!!!!!!!!!!!!!!!!!!!!!!!!!!!!!!!!!!!!! !